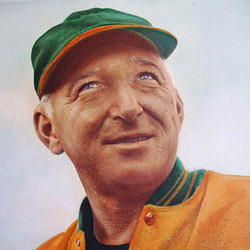 Hart Morris was the veteran member of the University of Miami coaching staff in point of service, beginning his career as the Hurricane line coach in 1937. The former University of Pittsburg All-American guard was associated with Athletic Director Jack Harding at the University of Scranton before coming to Miami with Harding in 1937. During WWII Morris was in the Navy and participated in the D-Day invasion of Normandy, France. Over a period of years the Hurricanes have turned out powerful lines which were more the result of coaching skill than of weight and depth. Line Coach Morrics was a contributing factor to Miami's fine line showing over the years. Morris is also a former basketball coach for the Hurricanes. His 100th career basketball vistory was a win over a powerful LaSalle team in the 1950-1951 season. Hart Morris will be remembered as a great two-sport coach for the University of Miami Hurricanes.